By David UndercofflerNovember 8, 2012, 7:00 a.m.
For seven years, he was the most famous driver you never saw. And with the next James Bond film ‘Skyfall’ opening this week, you still won’t see him in action. But he’s there. Known alternately as the Stig from BBC’s “Top Gear,” a stunt driver in such films as “The Dark Knight Rises” and “National Treasure 2,” and a professional race car driver in Europe and Australia, Ben Collins has made a career of driving fast on camera while his face is completely obscured by a helmet. It’s the second James Bond film Collins has worked on, after 2008’s “Quantum of Solace.” In both, Collins served as a stunt driver, though the two films provided remarkably different experiences. Much like “Solace,” “Skyfall” opens with a chase scene, but the latter was shot in the famed Eminonu Square in Istanbul, Turkey. Tight streets and alleyways meant the film crew couldn’t tow a trailer carrying a vehicle while the actors were filmed inside. Thus, the team used what is called a pod system. Picture a stunt vehicle, in this case a Land Rover Defender, with a one-man roll cage welded to the roof. Inside the roll cage is a steering wheel, hand brake, and gas and brake pedals and a seat. Collins’ seat. It’s from here that Collins controls the vehicle. Down below, the actors sit inside the cabin and pretend to drive while a cameraman, in this case second unit director Alex Witt, films the scene. The goal, according to Collins, is to make the scene look as lifelike as possible. Though this wasn’t his first time using such a setup to film chase scenes (that was on ‘National Treasure 2′), it was his first time doing so on top of an SUV. Making things even more challenging was a delay in the hydraulic steering system and the fact that all the steering inputs were muted; a full turn of the wheel had much less effect than it might on a regular car. “I’ve driven all kinds of weird machinery but this does take some getting used to,” Collins said. To make the Land Rovers better able to handle the demands of stunt driving — with a man in cage on the roof no less — Collins said the crew stiffened the vehicle’s suspension and widened the track. The extra weight on the roof also helped keep the Land Rover planted, but also made the vehicle more top-heavy. The engine was also modified to make it more powerful and responsive. “[The crew] developed that Land Rover so much that it could probably outperform a standard car,” Collins said with a chuckle. Prior to unleashing the stunt vehicles on set, the crew put them through their paces to learn just how far they could push them. “We put a couple of stunt boys in the car and punished it around an off-road course, and managed to get it up on two wheels,” Collins said. “We then made changes to the car. You don’t expect it to happen, you’re really on the brink of what the machine can do. We’re prepared on the set, so come the day of filming, the pod did exactly what we needed it to do. Obviously gave them the best ride we could,” Collins said, noting that during filming, the Land Rovers hit speeds of well over 70 mph. 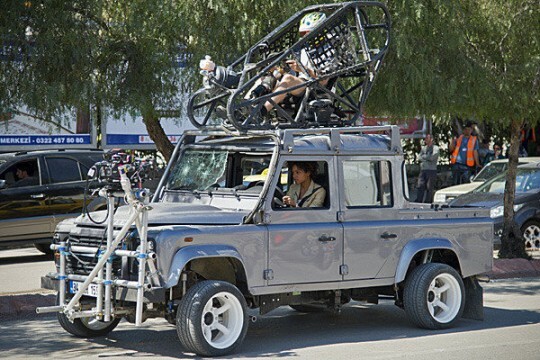 But Collins’ time behind the wheel on the set of “Skyfall” wasn’t limited to the Land Rover stunt vehicles. This being a proper Bond film, there’s also an appearance by the famed Aston Martin DB5, a car whose pedigree everyone, including Collins, appreciates. Judging by the opening sequence of the other Bond film Collins drove for, “Quantum of Solace,” the same could be said for his handling of the much newer Aston Martin DBS. That film opens with a dramatic car chase along Lake Garda in Italy between Bond’s Aston Martin DBS and a pair of Alfa Romeo 159s (as you might imagine, none of the cars fare particularly well). Collins said although the scene is only three-and-a-half minutes long, it was supposed to be much longer and took some three months to film. “It was originally 20 minutes long; it really had legs, but that’s the way it goes. Editing is brutal. I would love to watch the full-length version,” Collins said. Regardless of the scene, or the car, Collins said working on Bond films, in a driving capacity no less, was a thrill. As for driving iconic Aston Martins?